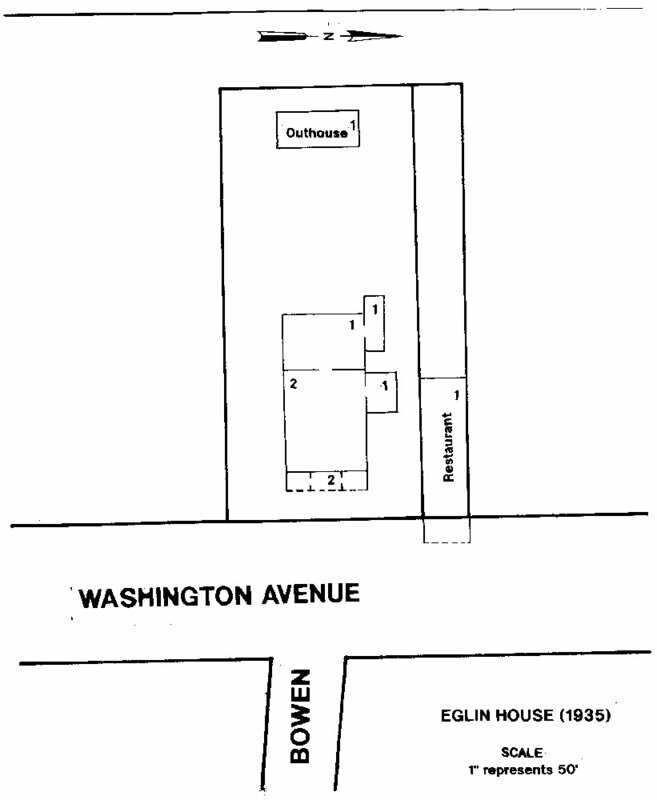 The Eglin House was located on the west side of Washington Avenue at Bowen Avenue in Lot 9, Block 27 of the Culmseig Map (1854). The Eglin House was a wood frame, one and two-story edifice of approximately 5100 square feet. The front of the house had a hip roof while a flat roof graced the west half of the structure. The facade of the house consisted of five bays. A central, transomed door with side lights was symmetrically flanked by four, full length, shuttered windows. The front galley (350 square feet) was marked by six turned post with decorative sawn brackets, and a fine balustrade. The posts supported a projecting hip roof and a belvedere (135 square feet) which had turned posts, brackets, and balustrade similar to the gallery. This configuration also sustained a projecting gable roof. The Eglins reared nine children at Ocean Springs: Albert M. Eglin (1874-1904), Eugenia G. Armstrong (1877-1962), John R. Eglin (1879-1946), Annie O. Eglin (1881-1963), Charles W. Eglin (1883-1966), Lillie M. Busbee (b. 1885), Verna Eglin (1886-1886), Thomas A. Eglin (1887-1914), Lena E. Gilbert (1890-1928). Fresh Beef, Mutton, Veal, Pork, etc., etc. The year 1904 commenced on a sad note as a fire had destroyed three buildings on their Washington Avenue property in December of 1903. A few weeks later, Mrs. Eglins eldest son, Albert, died on January 19th at the young age of twenty nine years. Another tragedy struck the Eglin family in 1914, when Tom Eglin, a flagman for the L&N Railroad was murdered at Gentilly, east of New Orleans. He was shot by two masked bandits while aboard the New York Limited (No. 38). The Eglins were very hard working people. Almost immediately after the 1903 fire, Mrs. Amelia Eglin began rebuilding. She added on to her restaurant, and was considering a new store building to replace the one destroyed by the conflagration. Through the years, the Eglin family was deeply involved in the commerce along Washington Avenue. At various times, an Eglin was involved in such businesses as: feed store, pool hall, meat market, grocery store, lunch room, restaurant, mercantile store, dry cleaning, and rooming house. A good example of Eglin entrepreneurial spirit was exhibited in March 1927, as reported by The Jackson County Times: The grocery store owned by John R. Eglin and meat market owned by Charles Eglin will soon be under one roof. Contractor Frank Galle, Sr is now remodeling the building and putting a new roof over both. A partition will separate the two businesses, but there will be an inside connecting door. The alteration will give the grocery store a much larger space to display goods. During her many years as proprietor of the Eglin House, Annie Eglin always resided there. It had a "homey" atmosphere and was very comfortable in the winter with its steam heat. There was a porch swing and rocking chairs. Several of the older, widowed, ladies lived here and would enjoy their time in idle conversation on the large gallery. In addition to the seven "tourist" rooms as they were called, there were also five apartments. Permanent guests resided in the apartments. Some of these long term residents were: Chester McPhearson (1883-1969), Mrs. Roy Sousley, James and Marie I. Farley (1903-1977), Erica Carson and Mrs. Riley. Several single school teachers also lived at the Eglin House throughout the years. Elsie Seymour Ryan (1905-1989) worked for Miss Eglin as a cook and housekeeper from the late 1930s to the early 1950s. After Miss Annie Eglin's demise in 1963, the Eglin House was struck by catastrophe. In the early morning hours of September 22, 1964, a fire commenced in the roof of the building. Fire fighters from Ocean Springs and Biloxi responded to the alarm. With a valiant effort, they kept the fire contained to the second floor. Several residents on the upper level were stranded and had to be rescued by ladder. Unfortunately one elderly resident, Mr. James E. Farley (1880-1964), lost his life in the conflagration. The upper level of the Eglin House was completely destroyed by the fire. The first floor suffered heat and water ruin. The loss to the Eglin heirs was estimated at $50,000. Clarence Galle (1912-1986) tore down the old structure in January 1968. Thusly, closed the final chapter in the fifty plus year life of one of Washington Avenues most historic architectural treasures. Brother Jerome Lepre, The Krohn Family, (Lepre: New Orleans, Louisian-1989). Marriages-Harrison County, Mississippi (1841-1899), compiled by Grace Husly and Minnie Atkins, p. 23. The Biloxi Daily Herald, “Ocean Springs”, March 1, 1906. The Daily Herald, "Tom Eglin, Murdered in L&N Holdup", July 25, 1914, p. 1. The Daily Herald, “Ocean Springs”, May 23, 1922. The Daily Herald, "Man Dies In Fire At Ocean Springs Apartment House", September 22, 1964, p. 1 and 23. The Jackson County Times, “Local News Items”, September 16, 1916. The Jackson County Times, “Local and Personal”, March 26, 1927. The Ocean Springs News, “Local News”, February 6, 1909. The Ocean Springs News, “Local News”, February 26, 1910. The Ocean Springs News, "Mrs. Amelia Eglin Passes Away", June 1, 1916, p. 1. The Ocean Springs News, "Landmark Makes Way For Progress", January 10, 1968, p. 1. The Ocean Springs Record, "Ribbon Cutting For Villa Maria", December 2, 1971, p. 1. The Pascagoula Democrat-Star, “Ocean Springs Locals”, August 24, 1900. The Pascagoula Democrat-Star, “Ocean Springs Locals”, May 23, 1902. The Progress, January 16, 1904. Sanborn Map Company (New York), "Ocean Springs, Mississippi" (1909), Sheet 2, and (1925), Sheet 4.